There’s no denying that teenagers can be apprehensive about getting orthodontic treatment. They’re entering unchartered territory with several new rules to abide by. And as a parent, it’s easy to feel like you need to take control by booking orthodontic appointments and reminding your kids to floss. But if they are old enough to have a mobile phone, they are old enough to take care of their teeth (with a little guidance of course!). Your teenagers are often in class, on sporting fields or out and about with friends, which means you can’t always be there when an orthodontic emergency strikes. So, it’s important for your child to know how to care for their braces during the day, including how to clean their appliances after lunch. Get your kids involved by taking them to the shops and purchasing a small pencil case or toiletry bag, filled with orthodontic essentials. 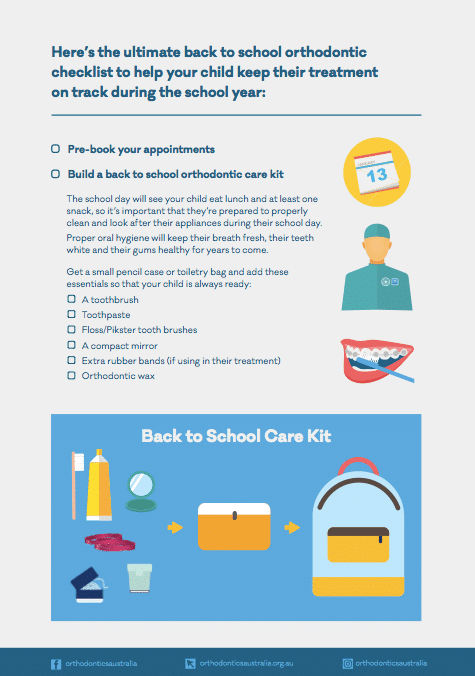 You can print out our Orthodontic Check List, so your teenager can monitor stock and let you know when something is running low. And if they are old enough, you can even add over-the-counter pain relief medication such as PanadolTM or NurofenTM to help them get through a busy day when experiencing oral discomfort. You might be driving, but it’s important for your child to take ownership of their orthodontic appointments. So, encourage them to use a diary (or digital calendar) to keep track of their next visit. This will give them some independence, making them responsible for the progress of their treatment. But make sure you have the dates in your diary too, just in case they miss one! At the end of the day, a lot of time, money and effort are invested into your child’s orthodontic treatment, however, you also need to trust them to make the right decisions when it comes to their smile. Eating hard or sticky foods increases the risk of dislodging brackets and wires, which can extend the length of the overall treatment. Please ensure they are educated on foods to avoid such as hard lollies, chewy caramel and popcorn. Please also remember that plenty of healthy, tasty and nutritious food are safe to eat with braces, so there is no need for them to miss out! Getting your child involved in their orthodontic treatment will help them take responsibility for their dental health and to be organised, both in their teenage years and beyond. But make sure they are seeing a registered orthodontist first, by using our Orthodontist Check tool.